In our society it often seems that consumerism has been raised to the level of an Olympic sport. We seem to be in competition with each other to see who can fill their homes with the most stuff. Consequently, most of us have much more than we could ever use, need or even want. If it’s only a want, you can live without it. It’s too easy to buy things we crave only to have it end up buried in the back of a closet, forgotten. Do you really need another pair of shoes to add to the ten pair you already own? We can invent all kinds of reasons why we absolutely have to have them, but the reality is we could go on living comfortably without another pair of footwear. Can I pay cash for it or will I have to use a credit card? Buying something on credit, even if it’s a great deal, only makes sense if you can pay off the balance at the end of the month. Otherwise, monthly annual interest charges of 19 per cent or more will soon eat up any savings you initially had and you’ll end up paying a heavy premium on your “bargain” purchase. It’s much better to stick to using your debit card or cash. Don’t have enough in the bank account to cover the cost of that new 50-inch TV? See point number one. This is a luxury item, not a necessity. If you want a new TV, find a way to save up for it. This takes time, to be sure, and modern thinking doesn’t lean toward patience, but consider. By the time you have enough money saved up, the TV you want will probably have come down in price or maybe you’ll see something you like even better for around the same price. Will I Make Use of It? We seem, on the whole, to need to have the newest technology, even if we’re not sure why or how we will use it on a daily basis. That is the siren call of clever marketing strategies and perhaps, the need to have what all of our friends have. And that thinking can apply to other purchases as well. We see something we like, so we buy it. Then, after the initial thrill of the purchase wears off, that brand new tablet or whatever it is may be all but forgotten in a drawer and that’s a waste of your hard-earned money. Some people use the envelope method to rein in spending. That is, they take out a set amount of cash from each pay cheque to spend on eating out and other non-essentials and put it in an envelope. When the cash is gone, they simply stop spending. Using strictly cash and seeing it deplete with each purchase makes you think twice before buying something. There’s certainly nothing wrong with finding entertainment in browsing, as long as we remember our budgets and aren’t prone to impulse shopping. However, when you have a specific need in mind, “get in, get on with it and get out” is a good rule to keep in the forefront of your mind. Why Are You Over Spending? 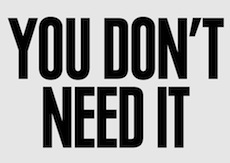 Make a clear distinction between needs and wants. Think twice before using your credit card. If you do use a credit card to make a purchase, be sure you can pay it off at the end of the month. Ask yourself how the purchase will be used on a regular basis and don’t buy anything you haven’t got a clear answer for. Set a discretionary spending budget and don’t go over it. If you’re shopping for specific items, pay for just those items and then leave the store. Having a lot of stuff doesn’t necessarily equal happiness. In fact, just the opposite could be true. Subjecting each discretionary purchase you’re considering to a few simple rules will help you to avoid buying things you don’t really need. I sometimes find myself wanting to upgrade a laptop or computer when my current device is still in perfectly good condition. I suppose it is the quest for the new and improved, vs the older and boring thing. I need to focus on something more fulfilling. I try to avoid walking into Best Buy or Apple Store, rarely do I walkout empty handed! The high interest rates will always destroy you if your not careful to pay them off right away. These are some great tips! Thanks for sharing! Article makes reference to monthly interest charges of 19% – WOW, totally wrong, such monthly charges are against the law in Canada (usury law). I suggest that the author was referring to yearly interest charges on credit cards of 19%. Not the first time the Financial Highway has gotten confused on this topic. Too bad; overall is a good freebie newsletter with sound, down to earth practical advice. Thanks for pointing that out David! It’s been corrected! Shopping online correlates directly with you Get in, Get On With it, Get Out tip. If you use laser focus to search for only the items you need, order them and sign off, you can avoid temptation to overspend and “just browse.” Plus, you can often get a free shipping promo code and not need to waste gas (or time) by driving to the store. This is actually my problem when i start seeing something interesting like books and dvds. I often go into a store and looks at stuffs and when i see something interesting, there i go again. I really need to have restraints, i am also weak about Handkerchief’s. I have a very simple technique to avoid buying things we do not really need — we avoid going to the mall often, unless we are going to buy something. Then, we head to the store where the item is sold. Afterwards, we are out of the mall and head straight home. No window shopping or walking to other stores. likewise, we do not bring credit card or extra cash that will tempt us to buy more than what we need. Forget the mall for me it’s Amazon, man I love that place too much, too easy easy to buy. The way I do it: set a budget, that’s how much I’m gonna spend this month, once I spent it all, no more touching my wallet. This just confirms what I see everywhere around me. I guess you have to be a thoughtful human being to avoid being a junk-collector, huh? I guess that means me. I hate junk, I hate having stuff lying around, I can’t believe how many people can’t park even one car in the garage any more, because it is full of useless junk! That’s not how I live. I am frugal, and like it that way. I don’t have much… have never owned a TV (of any size), or a stereo, or a cell phone, or… well… probably 3/4 of the things most people fill their homes with. I own a totall of 50 pieces of clothing, and yes, this counts each sock individually (and 2/3 of my clothes I’ve owned for 5 to 10 years… some more). And I don’t want more! Why would I… it is mostly just junk. I do have a few high-quality, expensive things, like two top-end computers, one for linux and one for windoze (that I built and upgrade from time-to-time myself). And a new car every 5 years or so. Plus my tiny little high-tech 2-seater aircraft that can fly 4000km on a tank of auto gasoline, gets 70 miles per gallon at 240kph (but only 50 mpg at 290kph), needs less than 100 meters to take-off, etc. Great little vehicle for exploring the extreme boonies I love to explore. And I always pay cash. I’ve never taken a loan or had any debt, not even mortgage debt. No freaking way will I pay interest payments — that’s paying money for…. nothing! That’s much too expensive. So, do I gain any advantages living this way? I think so. After high-school I worked [and learned] continuously for about 15 years… all that time saving money. Since then (another 15 years)… I’ve work “off and on”. When I work, I save. When I don’t work, I enjoy living like other people cannot. I’ve traveled all sorts of fascinating places in the world when I’m not working, gradually drawing down my savings (which has been 100% in physical gold and silver, no paper assets). How many of you would like to explore the world in a small-aircraft plus luxury RV-bus for 2~3 years at a time? Then work on designing, developing and implementing new products for 1~2 years at a time? Products which, by the way, now generate revenue without working! I guess that’s how I describe the difference between “normal folks” who live the life of bling-bling and debt… versus… the frugal life of high-quality and exploration and vacation and doing-my-own-things and… still have quite of few pounds of gold squirreled away. And all the time, everyone around me has thought I’m crazy and their sane! Hahahahaha! Hahahahahahaha! Hahahahahahahahaha! Somehow, I like it my way much better! The rest of you debt slaves… I hope it was worth it! This one is quite easy. What I do is to always create a list of things I need before I go to the shop. And if I find somenthing and consider buying it, I check the list, if it is not there, I just remove it from the basket.